​Please click on the following YouTube links to take you to a set of videos on Chanting Rules that I have created for budding chanters ! 06-GRD Iyers - "Harmoniously" for "Holding"
The source for the rules for chanting can be found in the Taittriya Upanishad. There are 6 rules of which 5 apply to Shloka Chanting and the 6th applies to Vedic Chanting. Mastery of pronunciation is the most challenging of all the rules (apart from Swaram for Vedic chanting). Proper pronunciation of the Sanskrit alphabets is the first step to good chanting and is absolutely non-negotiable. Since the phonetics or the “sound” aspect is most important, please learn the basic alphabets and spend considerable time on it till you get them absolutely correct. Some of the languages lend themselves well to transliteration eg. Malayalalam, while others do not. For eg. “Ka” or the க alphabet in Tamil is used for denoting 4 different alphabets in Sanskrit – Ka, Kha, Ga, Gha and is very challenging. If the Sanskrit alphabets are not learnt properly, then your efforts to learn an entire scripture and their rendition may not really yield ideal results. One way to get around this is to LISTEN incessantly to good renditions and imbibe the sounds in your system so that the rendition comes from sounds registered in the memory system. b) Deergham : takes about 2.5 times of Hraswam or (1/6 seconds x 2.5 times). A simple measure is 2.5 times snapping of your fingers. For eg. SAA is made up of S+AA and the AA should take 2.5 snaps of your fingers ! In regular chanting, Hraswam and Deergham are most common. And the most common error noted in chanting is elongating the Hraswam and shortening the Deergham. This happens when the Maatras in the sentence are not chanted properly by maintaining the time meter and hence ends up being compensated by the ending Hraswam or Deergham being completed botched up. 3) Balam : refers to the effort placed in uttering a letter. For eg. the letter Ra needs be recited as "Rrra" with a slight grinding on the "r". The airy "Ha" behind "Tha", "Kha", "Jha" etc. needs to be proper whereas most have the tendency not to distinguish between Ta and Tha, Ka and Kha etc. But please note that over-emphasis should also be avoided. Saamam: refers to the maintenance of appropriate speed / slowness in uttering letters. There are many who are impressed when chanting is done fast. Their understanding is Speed = Excellence / Mastery. This is not necessarily true. It is true only when Speed is achieved without compromise on the quality of chanting. It is difficult to chant slowly than fast - for each and every error will stand out like a sore thumb ! This is just like when we learn driving, the instinct is to drive fast than slow - because of lack of control.The key word is "control". I would recommend slow chanting to start with. Speed is a by-product of slow chanting. Without your knowledge and gradually, you will pick up speed. What is important is when you pick up speed, you would not have comprised with quality. Once you are really familiar with the text, you will fall in love with each and every syllable and will NOT hasten but lavish your attention over each and every akshara/syllable/word/sentence ! It is sad that many have been chanting Vishnu Sahasranamam, Lalita Sahasranamam etc. for years but still have areas where they mumble, keep quiet or generally gloss over with interesting sounds like clearning their throat ! It is obvious that there will be some difficult words or sections where we need to pay special attention to. Perfection is a never-ending pursuit and each level of improvement needs increasing amount of effort, care and the grace of the Almighty. How will you know that you have picked up speed? You will know this, when you feel you are chanting slowly, but a person sitting next to you says " Can you please slow down a bit?!" How will you know that you have improved in the quality of your chanting? You will know this when knowledgeable members of the gathering, peers and total strangers will come forward expressing their appreciation. You will find chattering groups starting to keep quiet as they feel the vibrations of good chanting. 6) Swaram: This is relevant only for Vedic Chanting. A shloka can be chanted any way one wishes i.e with a tune or without a tune (eg. plain reading). With respect to chanting shlokas, I personally prefer the employing of simple and popular tunes instead of employing raagas or elaborate tunes to sing them as I feel that the "Maatras" are compromised for the sake of singing. And I cannot sing anyways !! There are 3 main swarams for Vedic chanting except Sama Veda which has more swaras. a) The Swarita (single upper/higher) is the higher pitched intonation. In Vedic texts, it is denoted by a vertical line above the syllable. A Vedic rik that begins with a Swarita is very challenging to chant. Eg. The famous "Tryamabakam Yajamahe..." begins with an upper swara but is usually missed by many.The Deergha Swarita (elongated or extended) Swarita refers to the double-accented or “double upper/higher” pitched intonation. In Vedic texts, it is denoted by a two vertical lines on top of the syllable. b) The Anudatta is the lower pitched intonation. In Vedic texts, iIt is denoted by a flat line below the syllable. c) Lastly, the Udatta refers to “no swara” or no intonation. In Vedic texts, there is no marking for a syllable that is has a Udatta swara. Note: The mastery of Udatta or "no swara" is key to improving Vedic Chanting ! This is because, the Udatta is kind of the base line above or below which the Swarita and Anudatta lie. Hence one must know the base Udatta to be able to know how to intone the Swarita and Anudatta. Those who do not have a strong control on Udatta are generally poor chanters. The Rishis of yore had designed strong quality control methods to safeguard the sanctity of the Vedic Swaras through various patterns and combinations like Pada Paath and Krama Paatha. Additionally, 8 other combinations of a certain distorted order were also devised called Jata, Mala, Shikha, Rekha, Dhwaja, Danda, Ratha and Ghana. Of these, you may have heard of Ghanam more and those who had mastered Ghanam were called “Ghanapathis”. The employment of an incorrect swara or intonation can also change the meaning completely. Of these, most of us amateurs would easily fall into one of the above 6 categories. Most of us had never attended a proper Veda Patashala. However, the urge and drive in our genes to learn Vedas is there for sure. I would strongly urge you not to get discouraged and stop learning from the fear of making mistakes and I speak from personal experience. The challenge is to keep practising and be constantly in pursuit of perfection. We can achieve this by praying and seeking God’s grace for improving our chanting abilities. And of course, God helps those who help themselves. Therefore, relentless practice is a must and we should constantly be trying to improve on the status quo. A shloka has a metre or "chandas" called Gayathri, Anushtup etc. A chandas or metre means it is made up of a certain count of syllables eg. Gāyatrī (24), Uṣṇih (28), Anuṣṭubh(32), Brhatī(36), Pańkti(40), Triṣṭubh(44), and Jagatī(48).. Note that Anushtubh (32 syllables) is one of the most popular metre in which many popular and well-known shlokas have been composed. For eg. the famous Ganesh Shloka “Shuklam Bharadaram...”, Lalita Sahasranamam “Shree Maata Shree Mahaa Ragnyee..”etc. Now what is a syllable? A word is made up of syllables. And a syllable can be an anakshara (alphabet) (with or without an elongated vowel) or an inseparable mix of aksharas like “S-Ma” in the word “SMa-RAA-Mi". In this word, there are 3 syllables viz. SMa, RAA, Mi.The SMA and Mi are non-elongated while RAA is elongated. While chanting that word, try to chant the syllables SEPARATELY rather than as one word. That will ensure that each syllable and the associated vowel (or not) is emphasized properly. Your chanting will improve unbelievably if you focus on this aspect. This relates to proper and consistent application of Maatras. e is a general tendency to chant each shloka line in EXACTLY the same way in terms of time consumption for chanting, which can prove incorrect. This is because, while the count of syllables in a line is the same as in the other line (due to the Chandas or Metre rule), the syllables in 2 lines may NOT have matching number of elongated vowels or otherwise. The 1st line has only 1 Deergham while the 2nd line has 4 elongations. Now,assuming 1 Hraswam syllable takes 1/6 second to chant, which means the Deergham will take 2.5 seconds to chant. Then, mathematically, the 1st line will take (15x1/6)+(1x2.5) while the 2nd will take (12x1/6)+(2.5x4) . This means, the 2nd line takes more time to chant as it has 3 more "deerghams" than the 1st line and the 2 lines are NOT equal in time consumption. Now, imagine this for entire section you are chanting and you will see what I am getting at ! If you keep paying attention to this concept, after some time, intuitively you will be able to break up the syllables and gravitate to emphasized “syllable-chanting” rather than “word chanting” or “sentence chanting”. eg. Lalita Sahasranamam "CHIDAGNI KUN-DA SAMBHOOTA,, DEVA KAARYA SAMUDYATAA"
Eg. Lalita Sahasranamam "CHAMPAKAA-SHOKA-PUN-NAAGA,SAUGANDHIKA LASAT-KACHAA"
Eg. Lalita Sahasranamam "SHREE MAATAA SHREE MAHAA-RAAGNYEE, SHREEMAT SIMHAA SANESHWAREE"
For each line in a shloka or Vedic rik, analyse the 2 joining syllables and ensure that you chant them properly !! Note: Please also note that if the the sentence ends with a “deergham” then please emphasise it (exaggerate it slightly). For eg. in all the 4 examples above, all of the ending syllables are “deerghams” and need to be emphasized. But if there is NO “deergham” at the end of a sentence, please do NOT extend it.Also note that, there is a slight imperceptible pause after the ending "deergham" before commencing the next sentence unlike in the case of an ending "hraswam". Those who do not observe this, tend to run ahead of the others. Mathematical Balance proof : If you do not observe the “Maatra” rule, then you will notice that you are making up for it at the end of the sentence ! For eg. if you miss the “deergham” in the mid-section, you will make up for it by elongating at the end, even if there is a "hraswam” at the end ! Shlokas have a notorious habit of achieving the mathematical equation of making up for a deergham in a hraswam spot, if you do not observe the rule strictly!! For eg. in the famous Vishnu Sahasranamam shloka, "Shree RAAma RAAma RAAmEti....RamE RAAmE ManOramE", if you had incorrectly emphasized “ti” as a “deergham” in “RAAmEti” as “TEE” instead of a short vowel “ti”,then the ending “deergham” in “ManOramE” will get shortened and become a "hraswam" incorrectly. Try it out, experience it and improve your chanting ! B) VISARGA (the : or “Ha” sound) : There is a general tendency to chant the Visarga (denoted by a colon : for “Ha” sound) as “Ha” always. The akshara or alphabet succeeding the Visarga “Ha” dictates its pronounciation. Note: It is ALWAYS compulsory to chant Visarga “Ha” with a slight pause after if the following akshara is “Ksha”. For eg. in Rudram, we have “Na-ma-Ha-ksha tribhya” or in Devi Mahatmyam, we have “Koushaambh-HA-Ksharike Devi, Narayani Namostu Te”. Please observe aksharas or syllables like “Pra” (akshara) or “Tra” / “Kra” etc (syllables). They are made up of a mix of 2 alphabets like and can appear anywhere in a word – in the beginning, middle or at the end. You should ensure that you “catch” the first half of the syllable while chanting the previous word and move onto this word. Another eg. in Rudram, you have “Namaste asthu Bhagavan Vishweshwaraya, Mahadevaya…”etc. When it comes to “trymbakaya – t – tripuraantakaya – t – trikaalaagni…”, you should ensure that the“it” is captured properly as a joiner as “Tri” is made up of “Ta+Ra”. This is applicable for Vedic Chanting only. Where 2 or more successive swaras, appear, the LAST lower swara must be emphasized more i.e. the intonation must be one level lower than the previous lower swaras. For eg. in Laghunyasam, we have “Osha-dhi-vanas-patayo me…” where there are consecutive lower swaras, with the last one being on “ta” where one has to go down in intonation further than the previous swaras. This is especially required for Vedic Chanting though it is not followed strictly in practice as seen during renditons by amateurs and sometimes even by qualified priests. There must be slight pause or gap between a word that ends with Deergha Vowel and a succeeding word that commences with a Vowel. For eg. 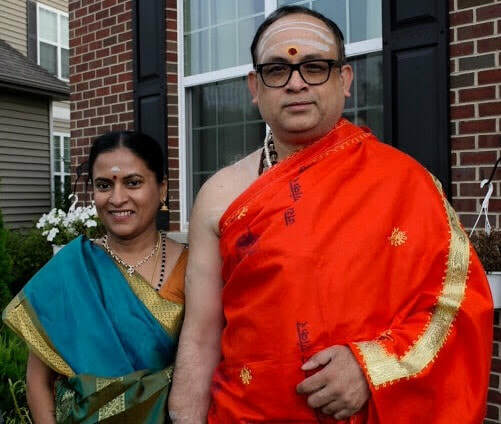 while chanting “NamastE – Astu Bhagavan Vishweshwaraya..” in Rudram, there must be a slight pause after chanting “NamastE” and before chanting “Astu”. This is because “rE” ends with an elongated vowel “E” and is followed by a Vowel “A” and the two words must be separate by a slight pause. The above is 100% applicable for Vedic Chanting but is not consistently followed and I wonder why. If you listen to the magnificient CHALLAKERE BROTHERS’ chanting (under"DEVOTIONAL" section in www.kannadaaudio.com) , you will notice the 100% consistency in application of this rule. If you record your rendition after you have become confident (after practising long and hard) and then listen to yourself, it can be the best method for bringing dramatic improvements in your chanting. This is because, when we practise, we may think that we are doing it correctly. But once we listen to our chanting, it is a reality check and can make us aware of our errors as well as the good parts . This will lead to focusing on our errors and as well as creating confidence due to the good parts. Keeping records of your past practice sessions and listening to them after a month or two will tell you what improvements you have made in your chanting since the 1st recording This can be quite some fun and make you blush at listening to what you thought had been a good rendition in the past ! c) Wherever you face difficulty, you will need to put in 10 times more effort. Whatever you are able to read easily at the first attempt will ALWAYS be easy to chant. Similarly, wherever you stumble or have difficulty, it will ALWAYS be difficult. To get over this, be stubborn and keep practising before you get it right. g) There is NO end to practice. Your quality of chanting will depend on the amount of time you invest in it. h) Show utmost respect to each Akshara, word or phrase. They will fetch you respect in turn. Shower your attention on them and linger over them with affection as you enunciate the Aksharas, words and phrases. Then see the effect it has on your soul and how the audience gets engaged in the puja or ritual being performed. One analogy I use to explain the above is that of a "Guard of Honour" where the dignitary walks through the rows of soliders and does not miss anyone. Imagine you are standing in a queue and a dignitary ignores you and walks past you to meet the other people. How do you feel? You should bring the same "bhavna" or emotion to your chanting. Each Askhara, word or phrase should be like a living and breathing person to you and not as an inanimate, dry and dreary prints on a page. H) "Popular / Familiar" Shloka or Suktam challenge : The most popular shlokas or Vedic riks are chanted by many and not surprisingly contain the least quality from a technical viewpoint due to varying levels of quality of the chanters ! The usual tendency is to chant fast with scant attention to detail. Common ones to suffer are popular sahasranamams, suktams etc. Should one use CDs and Tapes for learning Hindu religious scriptures ? 1) they state rightly that one should learn from a Guru in a true Guru-Shishya parampara or tradition. This also protects the student from the negative effects of incorrect chanting as protection is provided by the Guru's spiritual powers. However, the opportunity to learn from a Guru is not easily available. Furthermore, many of the so-called Gurus and teachers, who have come through traditional learning systems have been seen sometimes to be less than committed to their pursuit of their Dharma. While there are fantastic role models (my favorite Challakere Brothers for instance), there are others who make errors with aplomb and seek refuge behind "This is how I was taught!" with great smugness. I personally believe that once one has begun on the path of learning, if a Guru is not available, there is nothing wrong in adopting a Manasika Guru and commence learning from audio resources. Yes, there is no one out there to correct you if you make a mistake. But it is better to commence learning as you will find someone surely in the future who will take you under their wing. It is better to have tried than not to have even made an attempt to learn. Given the enormous lack of knowledge in the Hindu community about their own rich Sanatana heritage and the alarming spate of conversions to other religions (in a free India in the last 15 years more than under 800 years of foreign occupation), I think it is incumbent upon every Hindu, regardless of caste and gender, to commence their learning - with a Guru or with a Manasika Guru. I did receive proper Upadesham in Navakshari and Panchadasi and learnt the Nyasams . I became fluent in reciting Devi Mahatmyam by listening and practising along with the audio of Devi Mahatmyam rendered by the superb Shri Prakash Kaushik. As you can see, I have had great influence from Gurus like Shri Chandru Gurukkal as well as Manasika Gurus who I discovered through audio resources. In this age of technology, we should make the best use of online resources. We are laukikas and do lead a wordly life and if we are unable to find a Guru then one of the best ways to learn the scriptures is to make full use of online audio resources. The learning may not be perfect but learning something is better than learning nothing. This culture of learning is also important for the family and for setting an example for youngsters. I believe that bhakti and sincerity will negate any possible negative effects (if any) from incorrect chanting and I am fully convinced that some spiritual master will come across your way sent from the Almighty above. Listening sincerely to the masters and chanting along with them taught me many things and I imbibed many nuances too as well as developed a strong voice, breath-control and great stamina as I tried to keep pace with them. One aspect that probably helped me progress using this method most was my "shraddha" or dedication and paying attention to details to the best of my ability. 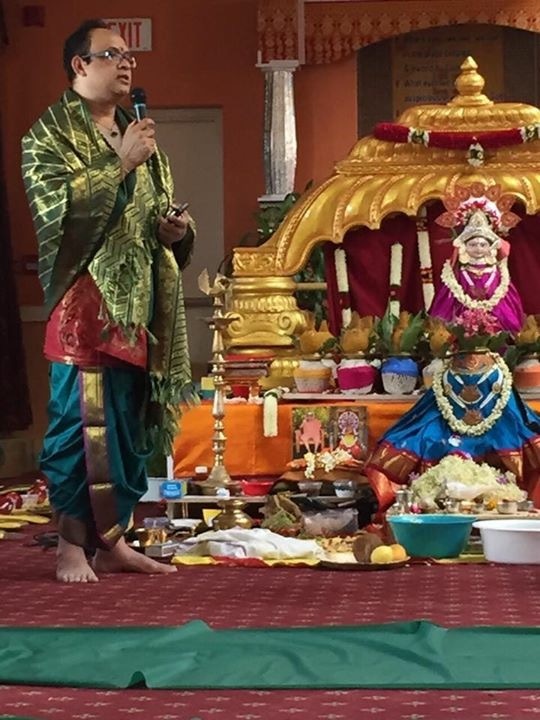 Note: When the Sringeri priests came to Toronto to conduct the Kumbabisekham, I learnt that they had given me a nick name "Ekalavya". I cherish that compliment to this date. Last Note on chanting: Please listen keenly to greats like CHALLAKERE BROTHERS (under "DEVOTIONAL" section inwww.kannadaaudio.com), and Shri Ganesh Sharma and Sri Parameshwar Bhat, who have chanted Udakashanti magnificiently. Listen to Shri Prakash Kaushik for his magnificent rendition of Devi Mahatmyam. You will imbibe much . Their chanting is perfection personified. I strongly recommend that you listen to them to improve your chanting. Whatever little I have achieved today goes a lot to both the traditional Guru as well as the Manasika Gurus. I employ the above rules as consistently as I can - which is a great challenge. What I have expressed above is purely my personal opinion based on my experiences and thoughts.